Isaias Afwerki (Tigrinya: Isaias Afwerki (Tigrinya: ኢሳይያስ ኣፍወርቂ; born February 2, 1946) is an Eritrean politician. 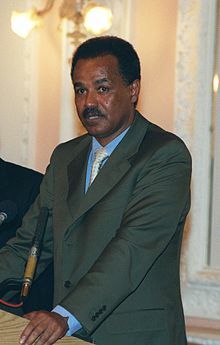 He became the first President of Eritrea in 1993. ↑ "Isaias Afwerki's Biography". News. 12 February 2010. Afewerki is a longtime fixture on Parade Magazine's annual list "The World's Worst Dictators"
This page was last changed on 22 April 2019, at 16:17.